Wow, that post title could be the entry way into a really exciting post. It could be, but it isn’t today. And just because my lunch was the most exciting part of my day wouldn’t normally make it blog-worthy, but today it is. Here’s the story… after I flunked out of the 21 vegan challenge as described here I still have been trying to make some changes to my diet, as in I’ve been trying to eat less dairy and less meat. It’s all been good and not that hard. I now enjoy an almond milk latte rather than one made with milk and I can’t even tell anymore that I’ve swapped one for the other. But then a few weeks ago I went to see a friend who is a holistic nutritionist and now it’s bye-bye wheat for a time. But it still makes me sad because I have had a huge love-affair with wheat over the years and it was hard to say good-bye. Now it’s not a gluten problem so I can substitute spelt or kamut flour where I once used wheat… but that means I have to make things and I’m not about to make crackers per say. 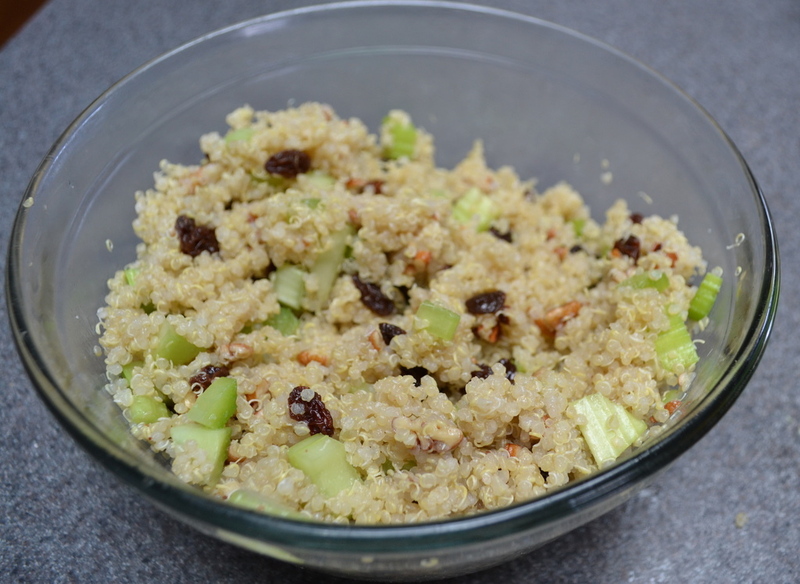 But do not despair over a lunch with no bread… enter quinoa! A tiny little grain that actually a whole protein and is very versatile… and isn’t everyone looking for a versatile grain? So here is my lunch, a super easy delicious quinoa salad hand-crafted by me. And I apologize in advance for the lousy photo, no one would ever accuse me of being a food photographer.